CAMPACC: Campaign Against Criminalising Communities - A Permanent State of Terror? 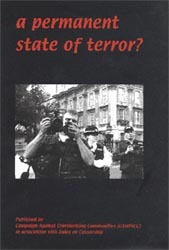 you are here: Resources » Publications & campaign materials to buy » A Permanent State of Terror? A Permanent State of Terror? If you were to believe the newspaper headlines the threat from terrorism is getting greater every day. Both police and politicians in the UK have even said that it is only a matter of time before the country is faced with a major attack. But is the threat a reality? Is it any more real than the WMD in Iraq? Is Al-Qaeda operating on our doorstep? Or does talking up such dangers serve some sinister political purpose? What are the real reasons for the suspension of civil liberties and the introduction of a “state of emergency”? Who benefits, apart, for example, from the intelligence services and arms manufacturers? It is clear that the distinction between legitimate protest and indiscriminate violence is now seriously blurred by current political discussions. Recent legislation like the Terrorism Act 2000 and the laws rushed through Parliament in the aftermath of 11 September have not only fostered a climate of fear but also criminalised minority communities, largely made up of asylum seekers and political refugees. CAMPACC has been trying to resist this for the last two years. A Permanent State of Terror, published by CAMPACC in association with Index on Censorship is both a record of the campaign so far and a serious attempt to analyse what is really happening. Contributors include: Noam Chomsky, John Pilger, Mark Thomas, Liz Fekete, Tony Benn, Gareth Peirce, Louise Christian, Liz Davies, Frances Webber, James Kelman, Harold Pinter, Conor Gearty and others.